Data Print Services (DPS) is a comprehensive outsourcing services that involves editing and processing data entrusted to us by our customers, printing the variable data on business forms using high-speed non-impact printers, inserting the forms into envelopes, sealing the envelopes and mailing them. We take a step further in DPS by offering planning and post-processing operations. This involves working hand-in-hand with the clients on sales strategies, market research and result analysis; all of which is integral in personalizing the information, be it marketing or customer services, delivered to the client's customers base. We call this "Total Integrated Solution". Our clients include telcos, financial institutions, insurance companies, giant retailers etc. 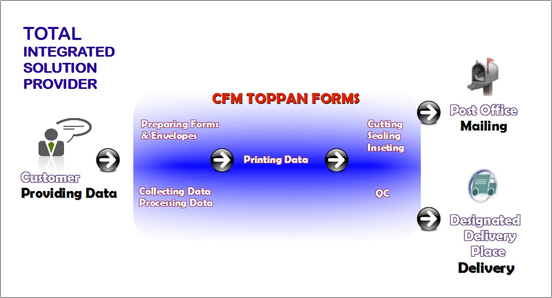 TOTAL INTEGRATED SOLUTION is our concept of end-to-end data printing under one roof. Client no longer have to source for different printing provider, material vendors or delivery service provider, simply because we provide everything for you. The bulk of data is collected from the clients. We ensure the highest level of security and confidentiality of the data, just as the client does. The data is then further processed to be fed into production. We also source for printing materials like pre-printed forms and envelopes. The printing activity capitalizes on the use of state-of-the-art printers that process at full throttle. Delivery in time is critical in data printing and printer technology is one area we have invested on to deliver this promise. The ensuing forms trimming, folding, inserting, sealing, sorting and packaging are machine-handled to ensure speed with precision. Quality Control (QC) is one area we emphasize on to ensure that we deliver with minimal fault and error. Finally, the processed goods are delivered to the post office for bulk mailing or to any designated location by the client. For more information, feel free to contact us here. Address: Lot 2, Jalan Usahawan 5, Off Jalan Genting Kelang, 53300 Kuala Lumpur, Malaysia.